Buddhist Temple caught with 40 Dead Tiger Cubs amidst trafficking claims. Thai authorities found 40 dead tiger cubs in a freezer during a raid on a Buddhist temple Wednesday. Authorities say they don’t know why the cubs were kept but plan to investigate. The temple, for its part, says the cubs died of natural causes and were preserved by a veterinarian, possibly to prove that the bodies had not been sold on the black market. The “Tiger Temple” in Kanchanaburi province charged admission and let visitors pose with tigers, The Associated Press reports. This week’s raid was prompted by allegations that the Buddhist monks were illegally breeding and trafficking tigers. Officers with Thailand’s Department of National Parks, Wildlife and Plant Conservation observe the carcasses of 40 tiger cubs and a binturong (also known as a bearcat) found at the “Tiger Temple” on Wednesday. Officials with Thailand’s Department of National Parks, Wildlife and Plant Conservation (DNP) have been transferring the temple’s adult tigers to shelters elsewhere. 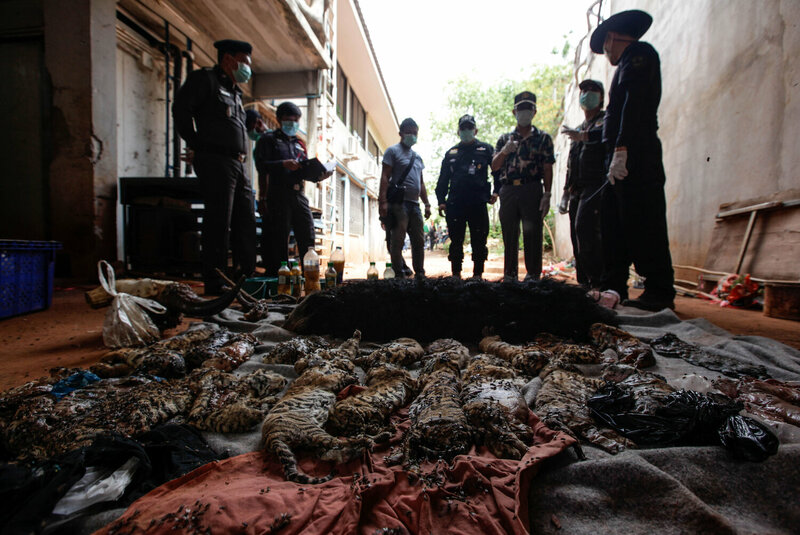 In the process, they made the grisly discovery of the 40 frozen cubs, as well as the body of a binturong (or bearcat) and the organs of other animals, the Bankok Post reports. The monks have repeatedly denied any wrongdoing. “[A]s happens in life, cubs do occasionally die for various reasons, most often when a new mother lacks the experience to properly care for them. In the past, as per Buddhist customs, these tiger cubs were cremated. The veterinarian no longer works at the temple, but on the Facebook account, the temple suggests that the vet might have made the policy change to provide proof that the temple was not illegally selling cubs or cub parts on the black market. The temple alleges that DNP officials were “fully aware” of the presence of the cub bodies. There is a thriving black market for tiger parts, for use in luxury goods and traditional Chinese medicine. Previous Previous post: Edible Six Pack Rings Could Save Marine Animals. Next Next post: Woman set on fire and killed for rejecting marriage proposal in Pakistan.